Hua Hin is a most precious and charming town, facing the seaside of the gulf of Thailand. 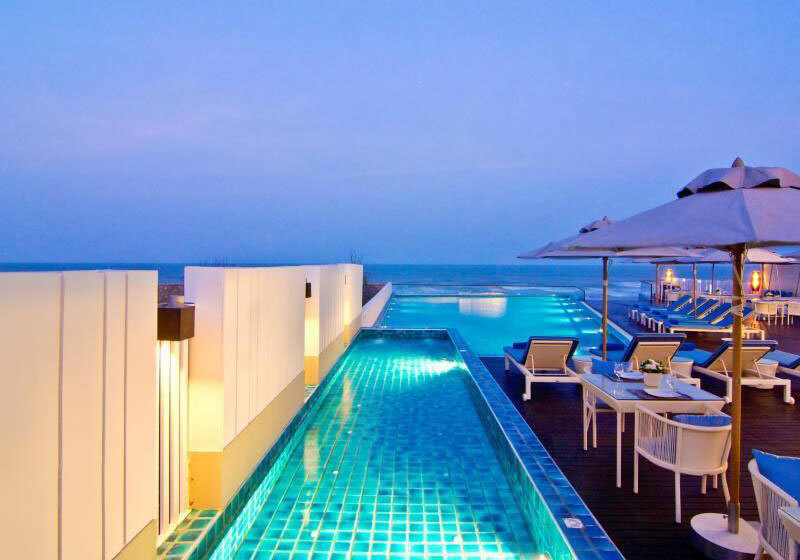 Get your day started at The Rock Hua Hin with the enjoyment of the sunrise over the blue sea. Also, get most out of your holidays during your stay in the luxurious beachfront spa resort of Hua Hin with brand-new facilities such as a beachfront swimming pool, private Jacuzzi and wellness spa cave. The Rock Hua Hin Spa Resort is freshly renovated in order to enhance the satisfaction of our guests. We are happy to welcome our visitors in the serene surroundings of the elegant resort with rattan weaved furniture on an authentic teak-wood flooring. Our spacious rooms, suites and Jacuzzi Pool Villas represent the sense of a relaxing retreat with a romantic touch, designed by a multi-award winning architect. Moreover, the infinity-edge pool benefits from a panorama sea-view of the Gulf of Thailand providing its visitors with a moment of total relaxation. Grasp the memorable experience of the paradise hideaway at The Rock Hua-Hin Resort & Spa. Short Description: The Rock Hua Hin Spa Resort is freshly renovated in order to enhance the satisfaction of our guests. We are happy to welcome our visitors in the serene surroundings of the elegant resort with rattan weaved furniture on an authentic teak-wood flooring.